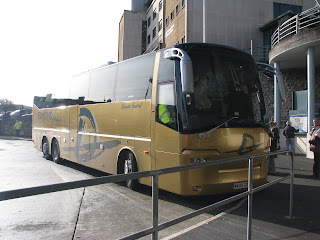 Here are a few interesting coach pictures from Saturday. 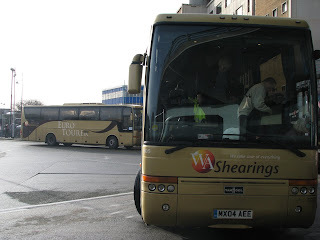 A few interesting things turned up and there seems to be an increasing number of tri-axel coaches around. News has come to me of the absence of an Olympian at Torpoint. C409 HJN has now left Torpoint and has moved into further retirement in Truro. 34809 was the first Olympian to be tranfered to Torpoint back in 2005 when LFJ 847W came to the end of her working life. She has been a very reliable and brilliant edition to the depot and I am very sad she has gone. More recently she has become what I would call the best Olympian at the depot. With 34812 spending all its time off the road, 34813 becoming unreliable and 34817 the same, 34809 has been hardest working of the lot. A great shame she was the one that has gone. So therefore this looks like the end for the Olympian's life at Torpoint and very likely soon to be the end of there working life. To think this time 4 years ago they were the newbys in town, now I can't imageine Torpoint without them. 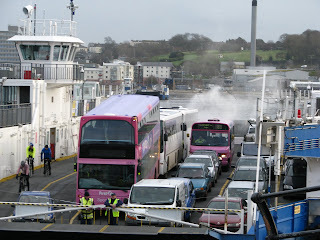 The film shows her departing Cawsand on one of her last weeks of service, film is quite fitting seeing her disapear from our bus scene. 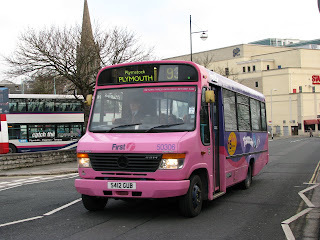 Talking to driver Tony Body yeseterday, it came aparent that since the buses have been working in Torpoint they have been more mistreated and used in different ways. 32760 and 32759 were seen in Plymouth because of differnet parts going wrong. Obviously the work would usually have been carried out in Torpoint though the 2 were sent to Plymouth. As another of the Plymouth Tridents were already off the road parts were taken from 32760 to get it back on the road. later when 32759 was brought in and more parts were taken from 32760. 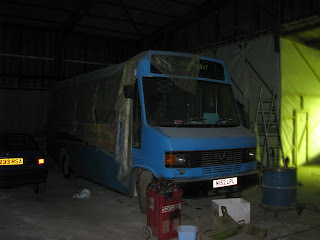 So it seems like the bus is already being cababalised even though it is perfectly roadworthy and only 4 years old! Saturday saw myself and good friend Louis Rawlings take a trip out as usual, but this time staying in the local area! And we never though you could have so much fun in a day in Plymouth! My days started out catching the 8:45 81C from Cawsand. Sadly it was a Trident but was the best one at least (32758). It didn't take long for troubles to start though. 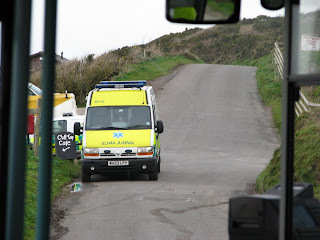 Coming towards Witsand bay holiday camp, 10 minutes into my journey we came across an Ambulence. I know it has every right to park where it was but if I'm honest it was inconsiderate parking as you can see in the picutre. If he had parked just a few feet further back, driver Terry could have threaded her through with no problem. But after an unsucessful attempt we reversed back and waited. After going down to the beech wear I alearted local "1st responder" Brian he came up and explained the situation to terry. Terry then convayed this information to the passengers saying that a young boy had, had a heart attack on Witsand bay and the crew of the ambulence were too busy. Brian could not move the Ambulence because of scrict rules. A few passengers cam eup with alturnatives while we sat there. Such things arose as "Can you bring another bus from the depot. The responce was that no other buses were avalible (though 52557 was sitting in the depot) and that no other drivers were avalible. 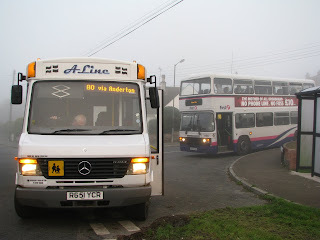 Another idea was reversing back down and going via Millbrook like the old 80B used to do back in the good old days!!! Though Terry rejected this after declaring it too dangerous to perform a reversing monover. 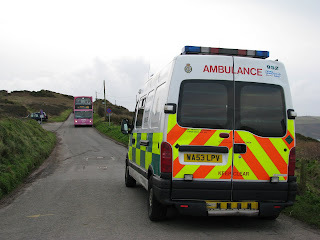 Another idea was when the bus bound for Cremyll arrived we could switch to that one alturnate buses taking alturnate passengers either side of the Ambulence. Though there was not a bus for another 45 minutes. Therefore this meant a wait of around 45minutes until the Ambulence was moved and we could proceed. Terry therefore drove at a fast pace to try and make up time, also shouting to the passengers "Is there anyone for Great Park". No was the responce and as 40002 had just turned up that way Terry took the desistion to miss it out to make up time. By the time we reached the ferry we had caught up around 40 minutes and missed our feryr by around 5. Therefore after trying to hard we lost another 10 minutes after waiting for the next ferry. Something to be learnt from the expierience though was while terry was trying to contact control to let them know he would be delayed there was no one in control, and no one at Torpoint depot. This meant terry having to ring up the fitter at plymouth to let them know the situation. really control should be managed at all times the buses are out though this is rarely the case. Luckily Louis was also late after oversleeping and his 11 not turning up!! Ahh buses these days!! 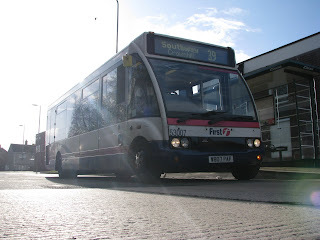 More problems have been happening at Torpoint this week with several buses that have been unseen by myself. 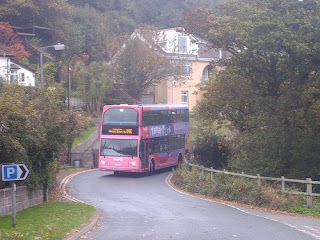 On Wednesday while in Cremyll driver Mike Jacobs had a failed C413 HJN before doing the Cremyll to Torpoint School run. 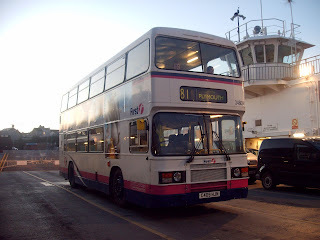 This bus wouldn't get going after layover in Cremyll after the run from Torpoint that morning. More details will hopefully come avalible as I get them. You can also note that for the past month odd she has had a dent where the fleet number is. Likely on a tree or lampost etc. Thursday saw either a broken down or very late Millbrook school bus. The bus usually reaches Millbrook before my 80 service gets there though it was not seen for the 10 mins we were in the village. Again I will hopefully get more details on this in the near future. 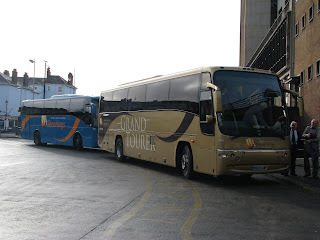 Talking to a driver today (non FDC) we both came to the decision that 3 of Torpoints buses have disapeared. Olympians 34812 and 34817 have not been seen by either or us for the last week 34817 and 2 weeks 34812. Any sightings please let us know. But I would guess again these are in Plymouth for the same reasons as has been highlighted in the previous post. 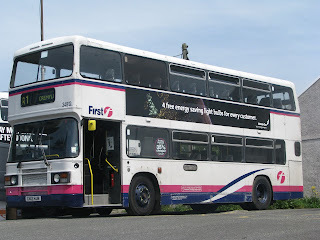 50306 has also been seen in Plymouth, reading Plymothian Transit it looks like with the wrong destinations aswell! PTOTPA will keep you informed of all the happenings at Torpoint in this time and as previously said I'm sure there will be many more. 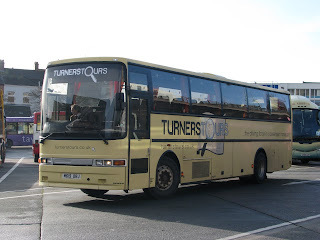 Since the news that the Engineer (fitter) at First Devon and Cornwall's Torpoint depot was made redundant there have been a lot of goings on with the fleet at Torpoint concerning the bus' health. At the end of last year and early this year problems were often occurring with the Varios. This saw as many as 3 Marshall Varios moved to Torpoint at one point to cover these. These being 52596/7/8 all ex-Essex vehicles. 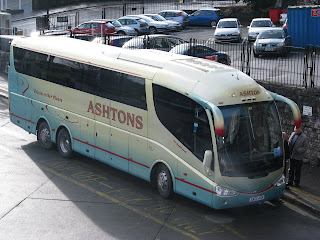 This also saw Torpoint Vario 50306 on trips on the 2 hour+ 93 to Dartmouth. Something usually covered by route branded Tridents. Just the wrong branding on this bus. 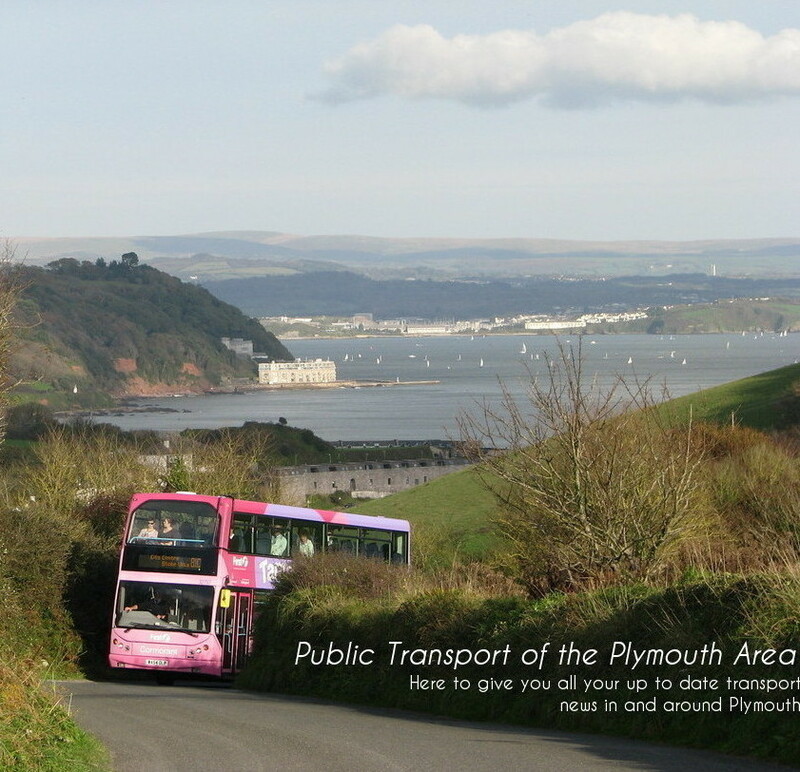 While coming into Plymouth the bus was packed and is no where near big enough for the amount of people that travel on the service. 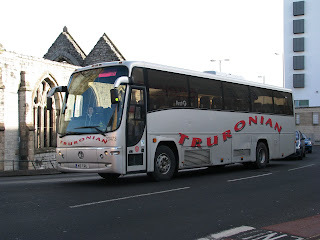 More recently the Tridents have had to make a trip into Plymouth to be repaired. Though this has caused problems with workings at Plymouth and Torpoint. ON a Coombe Dean school duty 32756 replaced the more usual Volvo B10M Citybus, either 38015 or 38016. 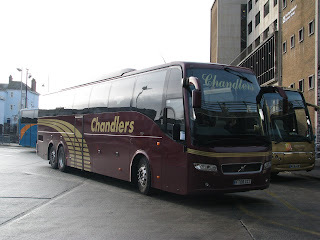 This therefore also went onto the routes this would then carry out 2s for the day. This would have confused Torpoint travelers as the terminus for the 2 is the same stop as where the 81 picks up from! This happened again a couple of days later with 32760 being used on 2s and 3s in the day. Next on the list was 40002. Routine Maintenance would often be able to be undertaken at Torpoint but now this does mean a trip to Plymouth. 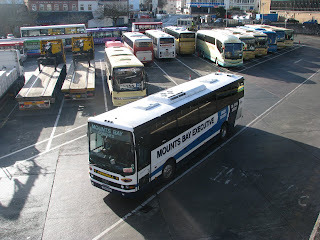 This bus was kept in the depot and not on any other routes. Though this did mean a bit of an Olympian revival with Olympians replacing her on all of her duties that week. Also pictured is 50306 working one of her duties when an Olympian was not available. This therefore leads me onto the next and most recent event. 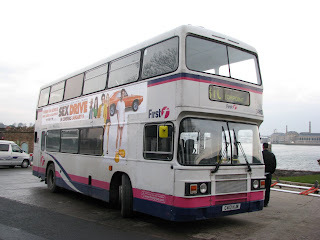 This was 34817 regarded by most drivers as the best Olympian in the depot. Though problems with her obviously meant a trip to Plymouth. When fixed she was kept for 2 extra days. She was therefore seen on the 2 and even more amazing the 83! Nice to see a proper bus on the 83 instead of the more usual Volvo B6. So so far its been going pretty bad at Torpoint and its probably costing just as much to keep sending them over to Plymouth. Though has been very interesting to observe the happenings at Torpoint and un-doubtabley there will be more to come!